Home » Uncategorized » Ready to stop your headaches? What gives you a headache? I’m sure any number of factors come to mind. The most common type of headaches are tension headaches which are often brought on by stress. And who hasn’t felt the stuffy sting of sinus pain? 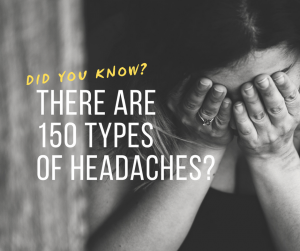 Then there are those awful migraines, the angriest of the headaches, accompanied by a suite of symptoms including nausea or vomiting, stomach pain, and/or sensitivity to bright lights, loud noise and strong odors. Sometimes smells can even trigger a migraine! Yoga – Yoga is proven to be among the most effective forms of self-care to help reduce headaches. In fact, one study actually demonstrated a significant reduction in migraine headache frequency when yoga was practiced regularly over a period of just three months. Visit your Chiropractor – Sometimes the root of your issue starts well below the neck and you just need to get your body back in line, literally. Encouraging results have been seen in a variety of studies, suggesting that a visit to your Chiropractor can help to reduce migraines. Participants in these studies have rated the results between good to excellent versus no treatment, mobilization, and ice. Headaches are common, but they don’t have to be. If you feel like you’re getting more than your fair share and are having trouble pinpointing the issue, please do not hesitate to contact me by calling 905-852-7969 or emailing [email protected] and we will work to identify your triggers and solutions together. ← Are you are not in the mood anymore?